New NEXGEN Colours - And More Soon! As promised, here's some more exciting news from our complete product lineup review, this time on additional NEXGEN™ offerings. 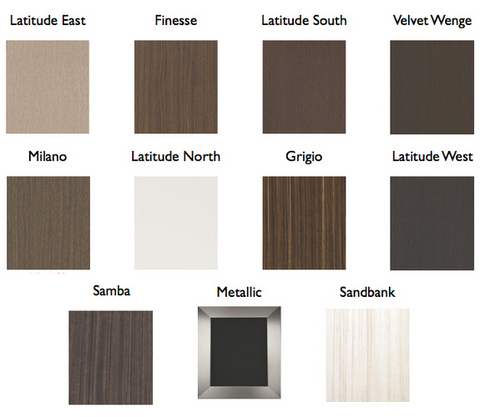 Our current NEXGEN™ product lineup includes 10 door style/colour combinations. We're expanding that late this fall to a total of 14 options with additional door style/colour combinations in Latitude North, South, East, and West. These new colour options follow the latest colour/interior design trends and will give our designers even more options to help you build the space of your dreams. And we're not stopping there. Our local Canadian-owned and operated suppliers are looking to confirm a few more colours in the coming weeks, and we've pre-accepted any new options for our standard regular-stocking NEXGEN™ product lineup. This means we'll be offering even more new NEXGEN™ door style/colour options by January. You can read more about NEXGEN™ in our product launch post here: Classic Kitchens - NEXGEN™. Even more details, with a video presenting the benefits of NEXGEN™, can be found here: Classic Kitchens - More on NEXGEN™. This expansion of our NEXGEN™ lineup follows the stain colour lineup expansion announced a couple months back. And we're not done with the announcements out of our last product lineup review: keep an eye on the blog for more on our new Fusion colour and finish options soon.